You tell me...as many times as you like. And then check back Saturday to see who came up with the best captions. If you think this is bad, you should see what Nancy Pelosi is eating. Kittens - the breakfast of champions! "It's crow, goddammit! You're supposed to be eating crow!" "Look, Laura! I'm playing a furry harmoniccordion!" "I think I cat, I think I cat!" George always loved that story. Damn! The only captions I can think of are totally sexually related and involve words that I'm not sure are allowed on your blog. So I'll just say, "Don't forget the mustard George." "I miss the White House chef. Sweet corn tasted less furry back in D.C."
Dubyah's favorite snack is a Kit Kat bar! OMG. Thank God Don said what he said, 'cause I thought I was the only one. Sorry. I can't come up with anything that isn't perverted. Not only is kitten a very nutritious meal, the hairballs also come in handy when you're out of cotton balls! "I Can Has Cheez Kitty." 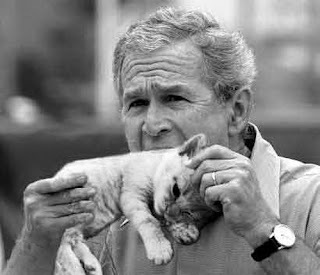 As George wrote in his memoir, "the worst part of giving the cat a bath was when the hair would stick to my tongue."